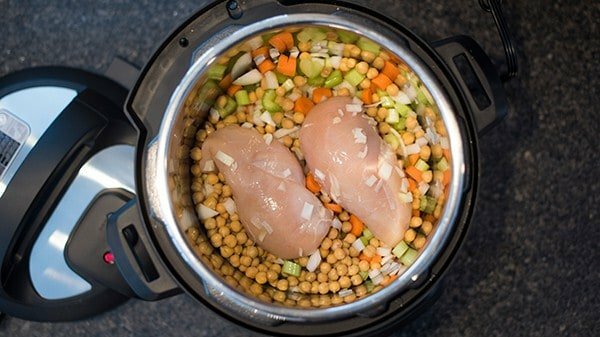 Lebanese chicken soup is ready in no time thanks to the instant pot. 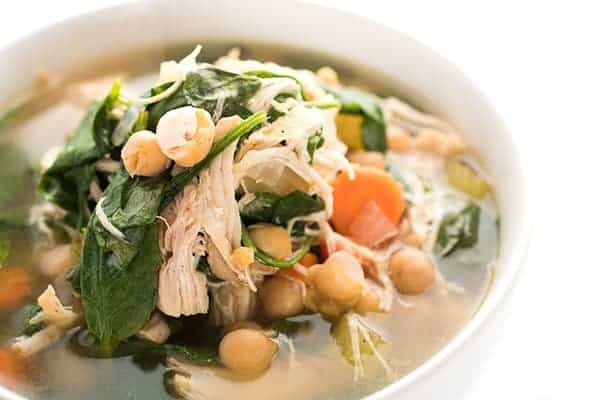 Filled with chick peas, lemon juice, cinnamon and spinach, this chicken soup recipe is naturally gluten free. 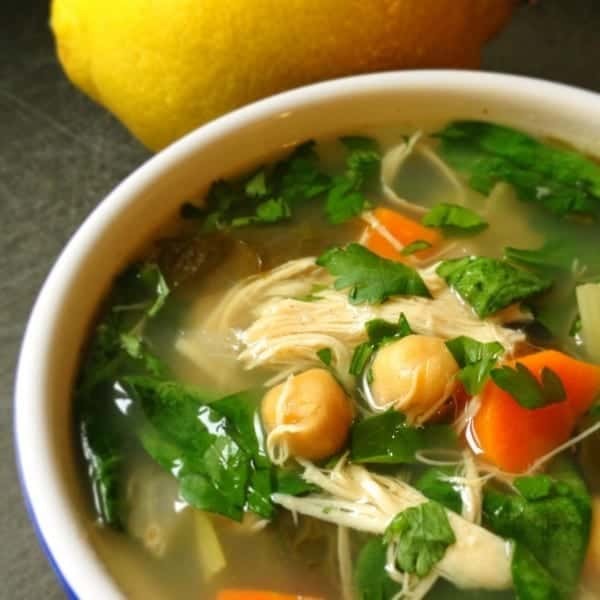 While I enjoy my mom’s chicken soup all year round, it is most definitely soup season right now in Michigan so I’ve been making this Lebanese version regularly lately!! My husband got me an Instant Pot for Christmas so I’ve been having fun playing around with it. Do you have one? 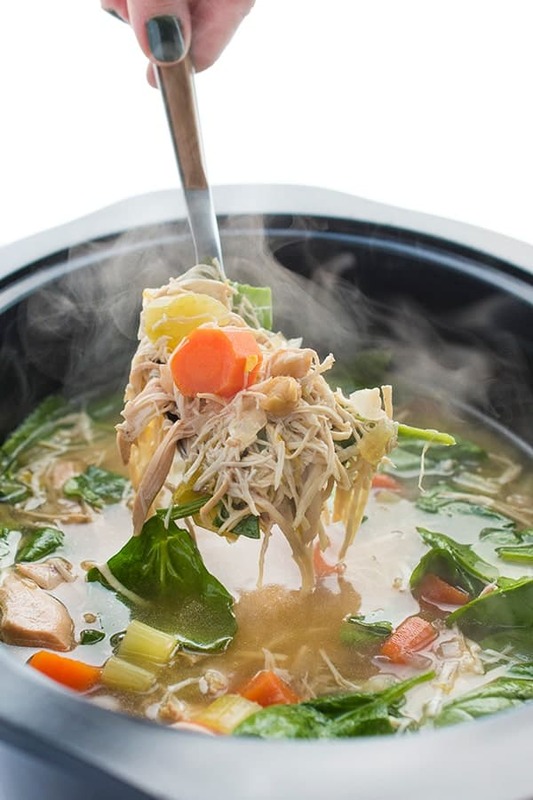 If not, check out my Slow Cooker Chicken Soup. 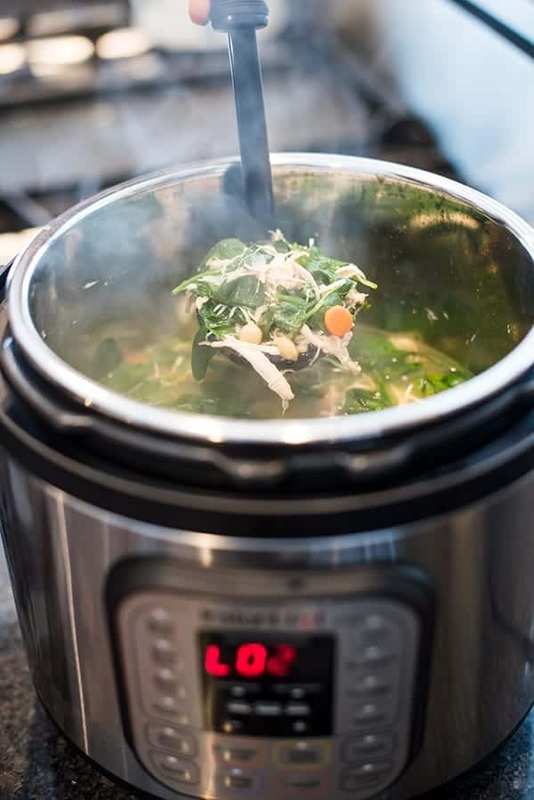 So far I’m still not an expert but one thing is for sure: cooking soup in an Instant Pot is a sure fire way add depth of flavor and richness to the soup. 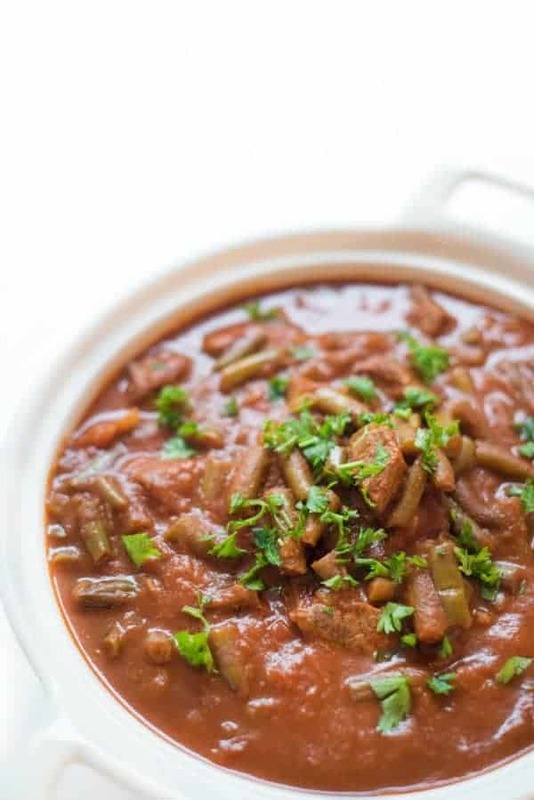 Similar to the slow cooker, it’s truly a one pot meal – you just dump everything in and press “SOUP!” While it does still take a good amount of time (30 minutes to cook plus 30 minutes for the steam to release, plus time for warming up) it is fairly hands off and easy. 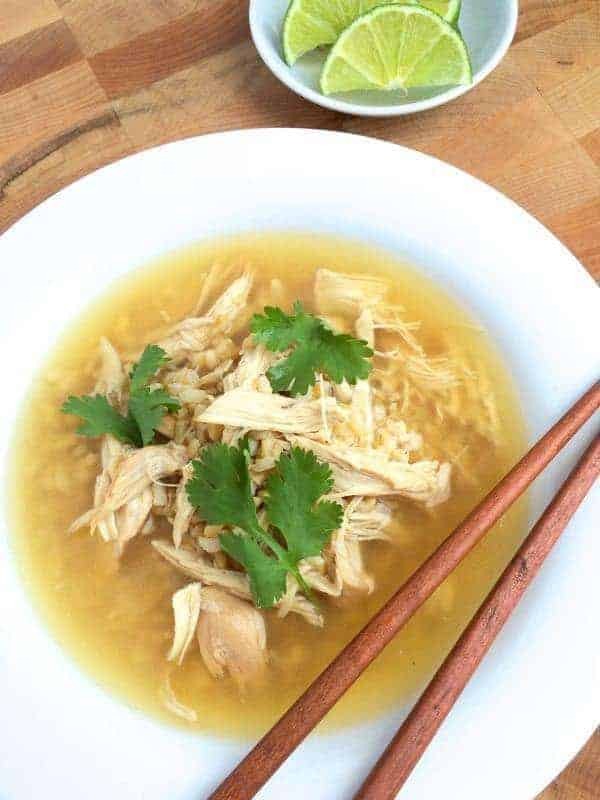 Whether you make this soup on the stove top, with a slow cooker or in the Instant Pot, just make this soup! You’re going to love the warm cinnamon, hearty chickpeas and bright lemon juice in each bite. Place the carrots, onions, celery and chick peas in the bottom of the liner pot. Top with chicken breasts then add cinnamon, garlic powder, salt, pepper, lemon juice and chicken broth. Close the lid, make sure the vent is closed then press "SOUP". Once the timer goes off, release the pressure naturally using NPR. This may take up to 30 minutes. Remove the lid then carefully shred the chicken breasts using two forks. Stir in the spinach before serving, stirring it for 1-2 minutes or until it's wilted. Check for seasoning and add more salt, pepper or lemon juice to taste. 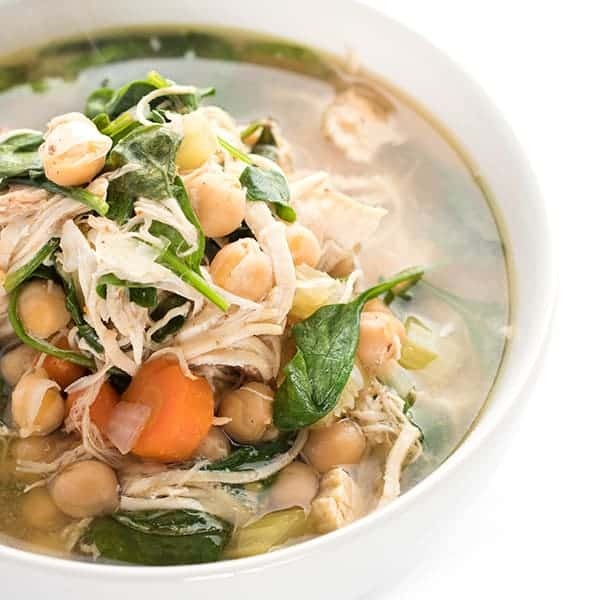 To reduce the total sodium, use dried chick peas, homemade or salt-free chicken broth and organic chicken. 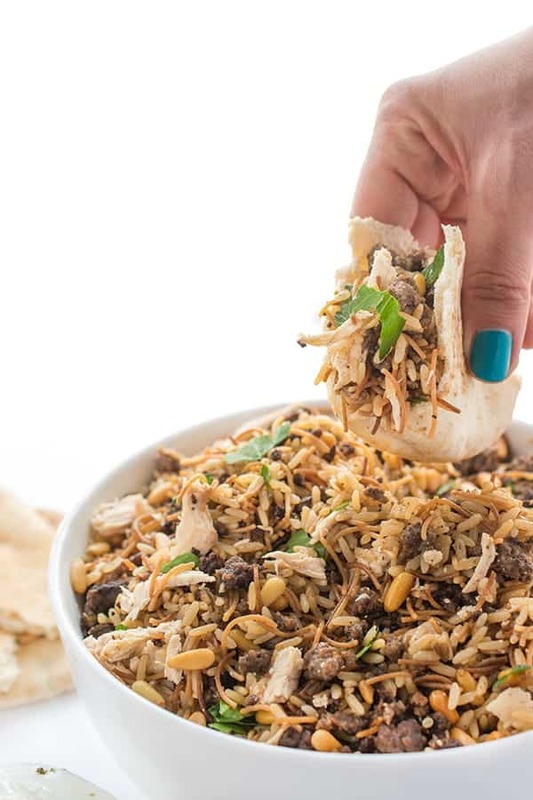 I have so many more Lebanese recipes on my Pinterest board. Check them out for yourself! 93% of the daily recommended sodium intake in EACH BOWL?!?!? Seriously??? Where is all this sodium coming from?? This is a deal breaker and I hope it’s a mistake. Is this timing with fresh or frozen chickem? I made this today, followed the recipe exactly, and it did not come out well. I highly suggest you greatly reduce your cooking time. Pressure cooking is stove-top cooking on crack, so if you look at your recipe with that it mind, the cooking time is far too long. It takes 10-15 minutes to poach chicken breasts on the stove-top. Here, they are pressure cooking for thirty minutes (plus the time it takes to pressurize) + sitting in that very hot environment for thirty more minutes. Both breasts shrunk and lost all texture and the vegetables were very mushy. There’s no rice or noodles, only COOKED chickpeas, so why the long cooking time? It would actually be faster and taste better if you made it on the stove-top. Otherwise, I think it should be ten minutes max, and even then maybe use quick release on the pressure. The soup button on the Instant Pot is a lot like the popcorn button on a microwave. You shouldn’t ever use it. The soup is still edible but not good. Wow. Wow. Wow. Loved it. I didn’t change a thing. 30 minutes of pressure and about 30 to depressurize. I ate 3 bowls and want more. Even my kids liked it. The only difference is it took me about 30 minutes to prepare, because I’m a slow chopper and my “chopper aid” is broken. How long to cook, and at what pressure level ? It depends on your instant pot – can you check the manual or look it up online? It varies! Made this tonight and it was absolutely amazing! So fresh tasting. I will totally make this again along with some authentic stuffed grape leaves and a huge bowl of yummy tabouli. My mother in law was Lebanese and she would have given this 5 stars if she was with us today. The cinnamon & fresh lemon are the stars in this dish. Thank you for such a great recipes! I’m so glad you enjoyed it!! Grape leaves are my favorite!!! Just to be clear. It’s 30 minutes under pressure and 30 minutes natural release? Just made this recipe. Turned out awesome. Thanks for sharing the recipe. I’m so glad you enjoyed it Emma!!! I just made this soup for dinner. Wow! 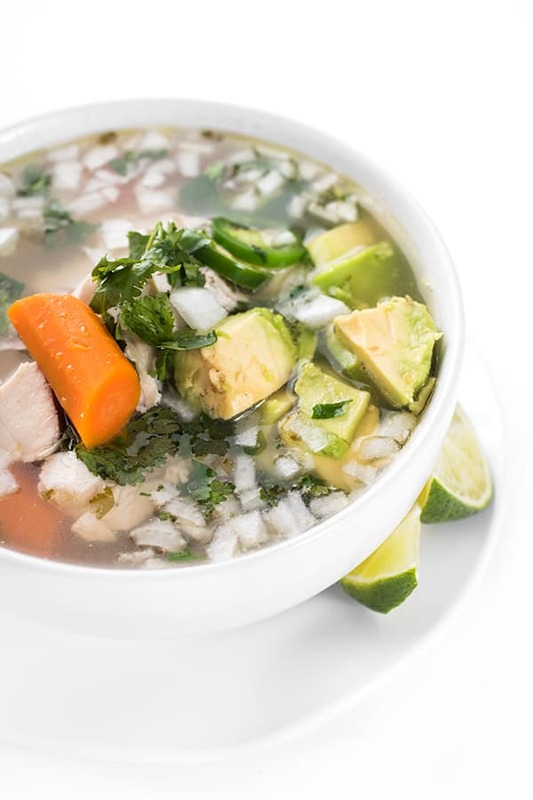 The cinnamon and citrus make this soup delicious.